Stacey: Welcome to Dr. Hotze’s Wellness Revolution. I’m Stacey here with Dr. Hotze,Founder of the Hotze Health & Wellness Center, and you are listening to part two of the interview with Dr. Stephen Sinatra. So, we are going to jump right into that program. Dr. Hotze: We’re so glad to have Dr. Sinatra back, and we’re glad to have an opportunity to share his wisdom and knowledge with you. I tell you, Dr. Sinatra is one of the leading physicians in the country on natural approaches to health, and he’s a Board Certified Cardiologist out of Manchester, Connecticut. He’s written numerous books, and we’ll give you information, contact information as the show goes on. So, let’s go right into the interview with Dr. Sinatra. Dr. Sinatra: Remember the other thing is a lot of doctor’s offices and a lot of…well, it’s technology. I mean, a lot of computers, Wi-Fi, they can drive up blood pressure in the direction of it being much higher because it stimulates sympathetic discharge. So it depends on how wired a lot of these offices are, with wireless technologies. That’s why the phone I’m talking with you right now is a wired telephone. I don’t have cordless phones in my house. All my computers are wired in the house. You don’t want the wireless because the wireless itself can be driving up the numbers of blood pressure. That’s why it’s so epidemic in our society today. That’s one of the reasons. Dr. Hotze: Ground, you neutralize. Dr. Sinatra: You’re discharging all that electromagnetic activity. That’s why grounding is so important for our health right now. Dr. Hotze: Right, we’re going to come back to that. Let me just finish up on the blood pressure. So on blood pressure, if somebody were to come in, what would you recommend to them if their blood pressure is not extremely high, but it’s elevated. It’s 140 over 90, 150 over 95, or something. They’re coming in, first time, they’re worried about…they’ve got high blood pressure. How are you going to handle that? How do you handle that? Dr. Sinatra: I’d say 60 to 70 percent. Totally off. Dr. Hotze: And we do it here. I just do it with…well, of course, we have a whole plethora of vitamin and mineral support we do. For my omega-3, I’ve used…of course, you can use fish oil, but I use cod liver fish oil. That’s what I take. I take a tablespoon of that every morning, whether I need to or not and I do it in the evening, too. That’s my go-to. Another thing, now, I’m going to ask you…so folks, just know, from a cardiologist, he says he can get 60 to 70 percent of the patients off blood pressure medication using his natural, nutritional support, diet, exercise, vitamins and minerals. Dr. Sinatra: And stress reduction. Dr. Hotze: And stress reduction. Dr. Sinatra: Oh wow, what a gift. Dr. Sinatra: What a gift. He said “Here, read this article. And he gives me an article by…I know you know him well. It’s Dr. Julian Whitaker. He gives me one of the Whitaker Wellness newsletters. He said “What do you think of this?” I said “Let me read it,” and I read it, and it was on heart disease. If you have a heart attack, and this was in 1986, ’87, ’88. ’88 is when this happened, but the article was somewhere contemporary to that. It said 15 percent chance of mortality after angioplasty, five percent after bypass surgery, within the first year. Well, if all you do is lower your blood pressure, lose weight, exercise, take some vitamins and minerals, you’ve got a one percent chance and don’t let the doctors invade your body. And my dad said “Well, son, what do you think about this?” I said “Dad, I wish I had known about it. If I had known about it, we’d have tried it.” He said “Well, this doctor says I need to take vitamins and minerals. What do I need to take?” And I went “Dad, dad, I’m a doctor. What do I know about vitamins and minerals?” He said “Son, will you find out please?” I said “Yes, sir.” I love my daddy and I did. Dr. Sinatra: He was your messenger. Dr. Hotze: Yes, so God used his adversity, the adversity in his life completely got me turned around on there seas of vehicles of greater benefit. And my dad lived. He should have never…the cardiologist told me later, he said “He should have never been able to get out of bed. He should have died within a year.” Well, he walked two miles every day and he ran his business every day with 365 employees. And the night before he died, I called him up on the way home from the office where I am now and said “Dad, how are you feeling?” He said “Son, I haven’t felt this good since I was 18 years old. And my food hasn’t tasted as good.” And then the next day he had cardiac arrhythmia going somewhere and he died, just like he said he would. Dr. Sinatra: And how old was he? Dr. Hotze: 80 years old. Dr. Sinatra: Hell, he had a good life. Dr. Hotze: He had a great life, but if I knew what I know now…now here’s something that we do here at the…I do a heart scan on all our guests that are males 40 and over, women 50 and over, we do a heart scan to check and see if they have any calcification in their arteries. And the reason I do that..
Dr. Sinatra: You have an EBCT equipment there? Dr. Sinatra: Oh, great, great. Dr. Hotze: So we do that. And I’m a big advocate of that because I believe when you show your patients, your guests…we call our patients guests. You show them they have a problem with calcium in their arteries, you have atherosclerosis, that’s a wakeup call. They’re going to do what you say. They’re going to “Yes, sir. Whatever you do. Yes, sir. I’m going to eat that. I’m going to eat right, I’m going to lose weight. Yes, I am.” You’ve got a blocked artery. It’s the only non-invasive way we can really check and see the calcium score. Now what we found…now I have a regimen and one thing…I follow the Lines Pauling/Matthias Rath view on heart disease and inflammation and use copious amounts of vitamin C.
They also recommend vitamin C, but they always recommend 100 milligrams per 25 pounds of body weight because that’s the average of the mammals that make vitamin C, that’s how much they make. And so I’ve taken, since I first heard Linus Pauling, I’ve taken 10,000 milligrams a day, and I now take somewhere around 20,000 a day. That’s just what I do and I encourage all my patients to do that, because I believe that cuts down on the inflammation in the coronary arteries and all that. So we have a regimen we put people on when they have the calcification in the arteries. We put them on high dose of vitamin C, we’ll put them on l-proline, l-lysine, put them on K2, we’ve got them on magnesium, coenzyme Q10, fish oil, all of them. I have a whole list of things that we give them. Dr. Sinatra: That’s good. How much K2 do you use? How much menaquinone-7 do you use? Dr. Sinatra: When you use the vitamin K2, you have to use menaquinone-7. Menaquinone-4 doesn’t work. And the minimal dose you need for menaquinone-7 is a minimum of 150. I usually recommend 300 a day. Dr. Sinatra: Because I have plaque. Dr. Hotze: We may do that. I don’t know how much is in the bottle. I put them all on K2 in such amount. I’m blanking on that. So we put them on a host of these things and then we have them come back in a year and let’s just check. Normally I do it in six months and then in a year because I want to see if we have arrested and reversed it. Because according to Matthias Rath and his studies, it grows 30 to 40 percent a year, the calcification. So if you have 100, next year it’s going to be 130, next year’s going to be 170, next year’s going to be 250 and then it begins to grow at an exponential rate because you’re growing at 30 percent a year. Well, if you can show it only grew 10 percent, or it stopped and then it regressed, well, my wife comes in and I do…this was a couple of years ago. I said “Baby, let’s just get a CAT scan on you. I’ve done it on me and mine’s zero. I have no calcium.” And I attribute all the vitamin C I’ve taken for years to doing that. For whatever it’s worth, that’s what I believe and that’s because I hold Matthias Rath and Linus Pauling’s theory of mild scurvy causing the coronary artery disease. So anyway, I check hers and she’s got a score 365. Oh my gosh, she is petrified. Oh my gosh. She’s got hardening of the arteries. She had renal artery stenosis, so she has elevated renin. So she’s on an ace inhibitor, low dose, and has been for years. So anyway, so she’s got this and she says she hasn’t been eating right, gained some weight, eating too many carbs and hadn’t been on the vitamins for a year because she thought it made her have loose stools. She had been taking them for years, but hadn’t taken them for the last year. So I sent her over to see a cardiologist friend of mine and he did a stress EKG and an echocardiogram and then he did the nuclear thallium stress. Well, the first two were absolutely normal, but the thallium stress and the posterior wall of her heart was just black as the ace of spades. And he goes “I’d send you to a cardiologist and they’d put a stent in there and do something, but you can clean this up just eating right.” He’s got his eating program, which is no carbs, cut your carbs out, fast two days a week, 48 hours, a water fast, and on and on. And so she got on that and nine months later, her score had gone from 365 to 280. It had regressed. Dr. Sinatra: No, that’s good. That’s good plaque reversal. Dr. Hotze: Right, and what we want to do is, I want to show here in our office that you can reduce plaque without having to go get bypass surgery. Now there comes a point you get so much plaque, it’s just hard to reverse it. It’s kind of like an old, rusty, chip. But if you catch it early, we’ve been able to reverse it in patients. And so we’re going to have an ongoing study on that. But anyway, I just thought I’d throw that in the mix about this whole concept of natural approaches to health and how I really got on that path because of what happened to my dad. And I’m grateful. And I tell all my patients, and I tell them over and over again, every drug you take is a toxin. I know that because during my first year in medical school, I took pharmacology and there’s a chapter on detoxification of pharmaceutical drugs and you have to detoxify a toxin. The definition of toxin is poison. And I make this point over and over again. You cannot poison yourself to good health. You can’t do that. It’s an oxymoron. And that’s basically modern conventional medicine, really, without saying it their real underlying belief is we can poison you to good health. We can give you toxins that make you healthy. And when God has given the body amazing and restorative power, put the right molecules in and of course, you probably agree…and I do too, let food be your medicine and medicine be your food. Start first with food. Dr. Hotze: That’s the big start. Dr. Sinatra: That’s why I developed Vervana. I mean, healthy food is the best place to start. Dr. Hotze: How do you spell the company? Dr. Sinatra: Oh it’s V-E-R-V-A-N-A dot com. Stacey: So that’s the best way for people to find you, Dr. Sinatra? Dr. Sinatra: Yeah, that’s my healthy food company. We do olive oils and pastas and I do a high protein pasta, and the pasta sauce I did in a green facility in Ohio. It’s BPA free, it’s all organic, non-GMO. All that stuff. Dr. Sinatra: You’ve heard of California Prop 65, right? Dr. Sinatra: Lead and mercury. Dr. Sinatra: We are assessed for those values and we passed California Prop 65. And I’ll tell you, that’s going to be the challenge of the next century, is the healthy food supply, it really is. Dr. Hotze: Well, listen, one last thing. 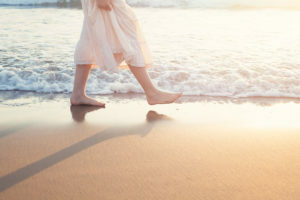 Let’s go to grounding and talk, as I mentioned to you beforehand, I had been encouraged by my pastor a couple of years ago to check out this whole idea of walking around barefoot like his dermatologist said he needed to do. And he asked me about it. And I ended up saying something about Mercola online and I ended up ordering the book Earthing. And I got it and it was sitting on my desk in my study and I was walking by, looking, what am I going to read today on Saturday, and there it was. Dr. Steven Sinatra was one of the authors of the book. I said “I’m going to take that.” I read that, then I went and looked and the videos and then I learned…now grounding, explain grounding. You’re the expert in it. I might be able to explain it fairly well, but I’m sure you can explain it better. Dr. Sinatra: It’s very simple, it’s very simple. I mean, the earth is struck by lightning thousands of times actually a minute, particularly around the equator. Now, in Florida where I live, it’s like lightning all over the place and in Connecticut where I lived, it’s very little lightning, but still. When lightning strikes the ground, the ground has billions and billions, trillions of electrons in it. So if you walk barefoot on the beach, on the grass, on concrete, not on wood, not on asphalt, but if you walk on ceramic it’s okay, stones, it’s okay. So if you walk on the natural earth, you can absorb these electrons through your feet. And basically in your foot there’s a K-1 point, which is an acupuncture point that goes all the way around to the back of your skull. And when you absorb these electrons, it’s like taking handfuls of antioxidants. It does the same job. And basically what you’re doing is you are absorbing these electrons and you’re attenuating the oxidative stress of the autonomic nervous system. I really believe that one of the reasons why we’re seeing so many bizarre diseases today and hypertension and cardiac arrhythmia is the computerized environment that we live in is really the antithesis of grounding. In other words, we’re living in a sea of electromagnetic soup and we need to discharge that soup and the best way of doing it is by putting your barefoot on the ground. I mean, sleep grounded. I just I believe in grounding with all my heart. Even when I go to hotels, I bring my grounding sheets with me, not just put them in the hotels. Dr. Hotze: I’ve always told all the people I know, Dr. Sinatra’s a well-grounded individual. Dr. Hotze: Listen, doc, so what I did is I went onto that website, earthing website and I ended up buying…I bought the grounding pads for my bed. One for me and one for my wife’s side of the bed. Dr. Hotze: I bought it for some friends and then I gave the leadership team…I have 12 members on my leadership team, I gave them all grounding pads that they can put on their desk or put down…and it’s mostly women on the leadership team, so they stand at their desk barefooted on the grounding pads all day. Dr. Sinatra: You are healing so many people. Dr. Hotze: Well, I’m a quick start. So when I read about it, it made sense and seeing you’re on it too, that just gives me good confidence. Dr. Sinatra: I’m barefoot right now talking to you. Dr. Hotze: Good. On the beach there, sitting there, listening. Well, listen, here’s the deal. What does it cost? Nothing. Dr. Sinatra: Nothing. Nothing to ground. Dr. Sinatra: That’s the most amazing story of all time. Dr. Hotze: Tell me about that. Dr. Hotze: Tell me what happened. So explain that to our audience, what it does to the blood, grounding. How it affects the blood. Dr. Sinatra: First of all, the day we did that study, I happened to be the Eucharistic minister at my church, and would you believe somebody has a cardiac arrest in the middle of church. So here I am in my gown. I had to address this person and we called the paramedics. And we go back to…the service is over and I go back to this room where I had 20 people and now we’re doing a medical experiment on grounding. Well, since I ground all the time, we tested my blood first while we were in this office and my blood was like red ketchup. I said “Oh my God. How can that be? I ground all the time. I sleep grounded.” But then I had to deal with this young boy with the cardiac arrest and I said “Well, that caused my blood emotional stress.” It made sense. So the next person, their blood was clumped. And the next person was clumped. I go “Wait a minute. Something’s going on here. We all can’t have red ketchup blood,” because these people are scientists. In fact, I had Perricone’s physicist there, I had lawyers, I had Dr. Perricone there, I had Dr. Delaney there. I had medical doctors who ground. Guess what happened? Inside the office where we’re drawing the blood, there was a cordless phone. And the cordless phone was putting out insidious, toxic vibrations that were making our blood thick. And I said “Oh my God.” So I threw out the cordless phone and then I had everybody go outside and then we brought them back inside the building and we retested the blood and all the blood went from red ketchup to red wine. Dr. Hotze: Did they go outside and ground? Dr. Sinatra: Yes, that’s what we did. I tell everybody to take their shoes off, walk on the grass, walk on the concrete, not on asphalt. And then we tested some blood and the blood went from red ketchup to red wine. Then I called up my researcher, one of our statisticians. I said “We have to devise a study on earthing, because it changed the blood.” He said “Are you serious?” I said “Yes. This is the greatest discovery that we’ll ever make in our lifetimes.” Sure enough, we did a double blind study. We had 24 people in the study and what we showed was after two hours of earthing, the blood thinned 270 percent. Stacey: So Dr. Sinatra, you’re basically saying that our beloved cell phones are creating a situation where we could develop conditions like Alzheimer’s? Dr. Sinatra: Yes. Whenever you use a cell phone, don’t put it towards your ear. Dr. Sinatra: Put them on speakerphone. Stacey: Okay, put it on speakerphone. Stacey: So don’t touch it. Okay. Dr. Sinatra: Don’t touch it or have it at least five inches away from the body. Look at all these males that are putting cell phones in their front pockets and they’re sterile right now. The data on that is alarming. A cell phone in the trouser, the front pocket of a male will drop sperm production 400 percent in two hours. They’ve done the research on that. So right now in our society, we have a lot of sterility in males. 50 years ago it was the women. Now today it’s the men with women. Dr. Hotze: What about when you plug a cord into your iPhone and listen to it that way? Dr. Sinatra: Well, if the cord is hollow, like a stethoscope, it’s perfectly fine. But if it’s a solid cord and there’s no hollow area, even an inch of a hollow area will discharge the EMF. But if it’s a cord, sometimes the impulses go right up the cord inside to your inner ear. And look at all these people who are complaining of tinnitus. Tinnitus is off the charts right now. And look at all the people you see in your practice that can’t sleep. They can’t sleep at night because melatonin production falls. By the way CoQ10 production falls with electromagnetic, as well. CoQ10 and melatonin are the two most important antioxidants to combat EMF as well the sun’s rays. Dr. Hotze: And EMF is electromagnetic field, folks. Dr. Sinatra: Yes, as well as UV light, the sun’s rays. Melatonin is important. Nobody can sleep anymore because there are so many computers and cordless devices in people’s homes. And listen, your bedroom has to be your castle. So in your bedroom, you don’t want any stereos, you don’t want cell phones, you don’t want cordless phones, you don’t want a TV. You just want everything clean. Some of my colleagues like…who’s that guy in Seattle, Washington? The German guy? What’s his name? Oh God, I just had a senior moment. Dr. Hotze: Senior moment. Well, you have a right to. You’re 70, you can have one or two. Dr. Sinatra: Anyway, I’m 70 years old. Dr. Hotze: You can have one or two. Well, listen. This has been a great discussion. We’ve covered a lot of different ground and I know our listening audience has enjoyed this, as well. It’s just been a very open and transparent discussion. So it was great. I love it. Now listen, for those of you that are interested in following Dr. Sinatra, it’s Stephen with a P-H. S-T-E-P-H-E-N Sinatra, just like Frank Sinatra. Google him, Dr. Sinatra. I think you have a website. Dr. Sinatra: Yeah, it’s heartmdinstitute.com. Dr. Sinatra: HeartMDInstitute.com, and Vervana.com. V-E-R-V-A-N-A. Then there’s always DrSinatra.com. That’s my healthy directions company, which deals in the Facebook and the vitamins and minerals, and things like that. Dr. Hotze: Right. So I would encourage you, and also where can they find your books, doctor? Dr. Sinatra: Oh gosh, they’re all over the place. Amazon is good. Dr. Sinatra: 24, I think. Dr. Hotze: I’ve only done three. I’ve got 450 pages written of the next one, which I’m going to divide into about five books because I found that my last book…my first books were a couple of hundred pages long each and kind of overwhelming for people. I have three books, Hormones, Health, and Happiness, Hypothyroidism, Health & Happiness, and then Do a 180 Join the Wellness Revolution, and everybody likes that little book because they can read it in about 20 or 30 minutes. And I’m going to start publishing short little article books. Maybe a book on coenzyme Q10, a short one. I know you’ve written one on coenzyme Q10, which I’ve read. Dr. Sinatra: Yeah, actually, if you go to the CoQ10 Association, I did a nice monograph for them. It was about maybe 25 pages, but if you Google CoQ10 Association, you can get it for free. And it’s an up to date blurb on CoQ10 I did. Dr. Hotze: Good, we’ll do that. Dr. Sinatra: That will help you if you want to write a book on it. Dr. Hotze: Well, I really appreciate your suggestion. Stacey: Alright, and Dr. Sinatra, thank you so much for joining us today. And everyone out there, there’s so much good information out there, so many ways to get healthy and well and you heard them discussing all of those supplements, CoQ10, melatonin, d-ribose, the cod liver oil, all of those great supplements. So you can always give us a call at 1-800-579-6545. That’s 1-800-579-6545 to order your heart health supplements, or you can go to HotzeVitamins.com. That’s H-O-T-Z-E vitamins dot com. And it is such a privilege to have Dr. Sinatra on the program today. It was a great show. Thank you for joining us today here at Dr. Hotze’s Wellness Revolution.